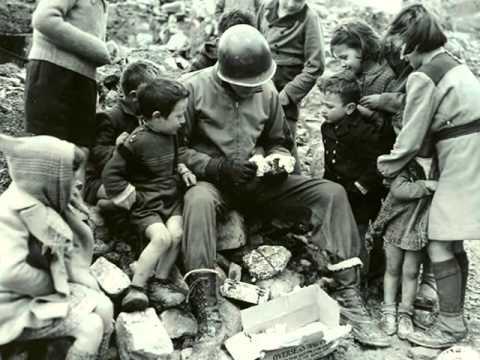 The soldiers were scattered across Europe with the loneliness of war. The world was caught up in a total struggle. Women had gone to the factories; children were collecting scrap metal. The “war effort” was universal. In many places, food was rationed. The madhouse of consumption belonged only to the war; everything else could wait. And there was Christmas. Hollywood and Tin Pan Alley were part of the effort as well, cranking out songs that have never gone away. The mood was one of deep sentimentality and hope. “I’ll be home for Christmas,” the radios played, and soldiers wept. Being born in the early 50’s, I grew up in the cultural aftermath of the Second World War. The adults had not recovered from the experience and continued to remember it actively, even passionately. When rationing ended in Britain in 1954, there were those who felt that something important had been lost. At one point, the Labour Party had argued for indefinite rationing. The commonality of shared suffering, it seemed, was a stronger bond than the commonality of shared prosperity. Interesting that. No one was nostalgic for the war itself. The fighting, bombing and the certainty of death and injury were gladly left behind. But the common bond of a common effort remained a lively part of a generation’s memory. The stories only ended when they were laid to rest. The nostalgia, I think, was for the commonality, an experience that banished loneliness and gave meaning to even the smallest actions. The prosperity that followed was hollow. For what purpose do we now shop? Commonality is a fundamental part of life in a healthy world. It is akin to love itself and an extension of self-sacrifice. It is a world in which we receive far more than we give. It is also something that lies at the heart of the classical Christian account of salvation. We are saved within an act of inexhaustible and all-encompassing commonality in the incarnation, death, and resurrection of Christ. Unless those events are seen through the lens of commonality, they cannot be understood. St. Paul describes Christ as the “Second Adam.” He does not mean by this that Christ is merely a “do-over,” a second start for humanity. Rather, as an Adam, He is a summary and “re-capitulation” of the whole of humanity. The name “Adam,” in Hebrew, also means “man.” It is the term for our collective humanity as well as the man, Adam. As Second Adam, Christ is the new Man, but also a collective new Man. It is this that is referenced by St. Paul when he says that we should put off the old man and put on the new (Col. 3:9-10). The Virgin is more than the one who carries the Christ Child in her womb; she is also the source of His humanity. He “took flesh” of the Virgin Mary (σαρκωθέντα ἐκ Πνεύματος Ἁγίου καὶ Μαρίας τῆς παρθένου), the Creed tells us. That “flesh” should not be seen as an isolated reference to biological meat. It is everything that constitutes our humanity: “and was made man” (ἐνανθρωπήσαντα). The reality of our humanity, whether of the First Adam or the Second, is collective. In the Orthodox tradition, the two Sundays before Christmas are set aside to commemorate the Holy Forefathers, and the Holy Ancestors. It is a recognition that in the flesh of Mary is the flesh of many generations, indeed, the gathering of all flesh. It is a recognition that in the faith of Mary is the faith of the generations that have gone before as well. Christ has come for us, in us, that with us in Him, He might live, die and live again and we as well. This is the true fullness of Christmas. In this true story of Christmas, everyone comes home. We are all there. We are united together in Christ in the common struggle that is our salvation. This war in which we live is the only true World War, and perhaps greater than that. Its outcome has long ago been determined in Christ but it remains something to be lived and fulfilled in us. We’ll be home for Christmas. Christ is born. Glorify Him.